NASA's Dawn probe captured this image of the dwarf planet Ceres’ northern terrain on April 14 and 15, 2015, from a distance of about 14,000 miles (22,500 kilometers). NASA's Dawn probe has reached its first science orbit at Ceres, marking the start of the spacecraft's serious scrutiny of the mysterious dwarf planet. Dawn arrived at the science orbit on Thursday (April 23), spiraling down to an altitude of 8,400 miles (13,500 kilometers) above Ceres, NASA officials said. The probe achieved this milestone on schedule, but not without a bit of drama. The Dawn spacecraft’s four mapping orbits, shown to scale in altitude with the size of Ceres, which is about 590 miles (950 kilometers) in diameter. Dawn’s mission at Ceres is scheduled to end on June 30, 2016. The $466 million Dawn mission launched in September 2007, tasked with orbiting and study the two largest objects in the main asteroid belt between Mars and Jupiter — Ceres and the Vesta, which are 590 miles (950 kilometers) and 330 miles (530 km) wide, respectively. Both bodies are believed to be intact protoplanets left over from the planet-formation period, so investigating them should reveal insights about the solar system's early days, as well as how Earth and other rocky worlds were put together, NASA officials have said. Dawn orbited Vesta from July 2011 through September 2012, when it departed for Ceres. The probe arrived at Ceres on March 6, becoming the first spacecraft ever to orbit a dwarf planet and the first to circle two celestial objects beyond the Earth-moon system. 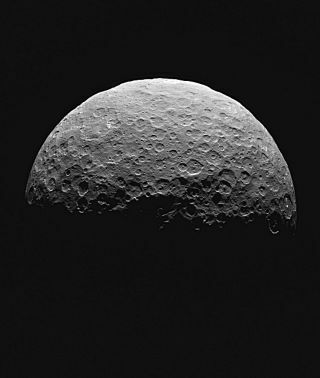 Dawn will map Ceres' surface in detail and attempt to determine what the dwarf planet is made of. The probe will also investigate some of the object's most intriguing mysteries, attemping to confirm the existence of water-vapor plumes and determine the nature of strange bright spots on Ceres' surface. Dawn will perform this work from a series of ever-closer orbits, called RC3 (the current orbit, whose name is short for "rotation characterization 3"), Survey, HAMO (high-altitude mapping orbit) and LAMO (low-altitude mapping orbit). The altitudes of the lattter three orbits are 2,700 miles (4,400 km), 900 miles (1,450 km) and 230 miles (375 km), respectively.